SAVANNAH, Ga. – The U.S. Army Corps of Engineers partnered with the U.S. Coast Guard Auxiliary to provide free boater’s safety inspections at J. Strom Thurmond Lake, June 15 starting at 9:30 a.m.
Officials with the Corps and the Coast Guard will perform vessel safety checks at Scotts Ferry boat ramp, located on the South Carolina side of the lake in McCormick, S.C., to ensure boaters are in compliance with all safety requirements. The vessel safety checks will include inspections of various items such as ropes, anchors, fire extinguishers and personal flotation devices. Vessels that pass inspection will be awarded a U.S. Coast Guard Auxiliary decal that informs all boating law enforcement agencies that the vessel has met annual safety check requirements and is in compliance with all federal and state boating laws for that year. Owners of vessels that do not pass inspection will be provided a written report that identifies the steps to achieving full compliance with federal and state regulations; however, no citations will be issued during the courtesy check. Passing the vessel safety inspection will not only increase safety on the lake, but may help boaters avoid substantial fines. It could also help boaters obtain a discount on their boat insurance. 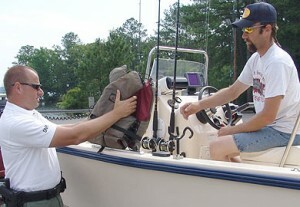 All decals are issued annually and become null and void as of December 31 of the year a boat is inspected.